1. This series machine adopt manual control,hydraulic loading, electronic measurement,liquid crystal display, auto processing test data, test results print, and mainly used to perform tension, compresson, bending and other mechanical property for metallic and nonmetallic materials. 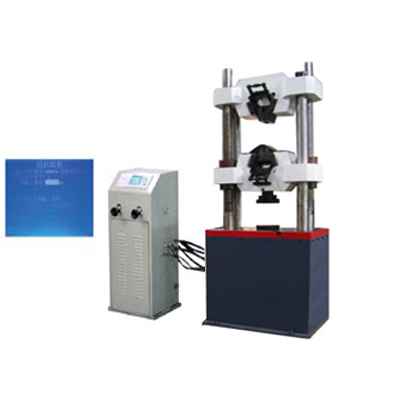 It completely accords with national standard GB/T16826-1997 Electro-hydraulic Universal Testing Machine and GB/T228-2002 Method for Tensile Test of Metallic Materials at Room Temperature. Also complies with standard ISO, ASTM, JIS about materials requirements. It can get yield force, tension strength, and other mechanical performance indexes for different materials. If equipped with accessories，can perform mechanical performance tests for high strength bolt, chain, steel wire etc. 2. Utilizing the transmission mechanism of double leading screws and middle beam, underneath type hydraulic cylinder, easy to install specimen, with high stability and nice appearance. 3. WE(S) series digital display hydraulic universal testing machine is an ideal substitute for traditional type.